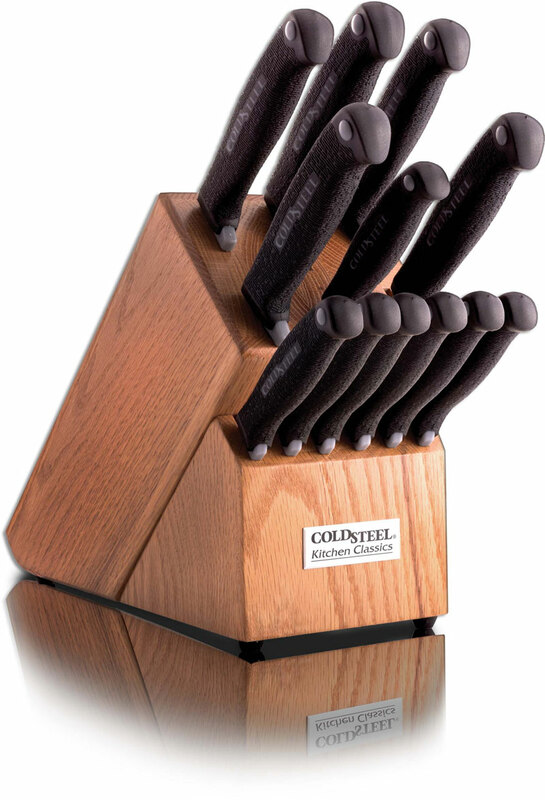 The illustrated Cold Steel Knife Set is the Kitchen Classics Cold Steel Kitchen Knife Set that includes six kitchen knives, six steak knives, and a twelve slot oak storage block. Each knife in this Cold Steel Kitchen Knife Set has a blade made of flat ground German 4116 steel, and a sturdy Zy-Ex handle with textured Kray-Ex overlay for secure, non slip grip. The Kitchen Classics Cold Steel Kitchen Knife Set includes a paring knife, a boning knife, a utility knife, a chef's knife, a slicer, a bread knife, six steak knives and a twelve slot oak block for storage. This item is heavy, extra shipping charges may apply.